This cycling helmet is constructed from polycarbonate shell and EPS foam to absorb shocks and provide your head with maximum protection. 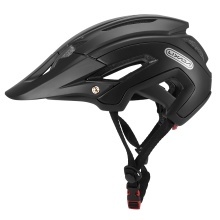 It features 16 air vents, adjustable dial, breathable chin guard, detachable visor, reflective sticker, and moisture-wicking lining, great choice for those who love cycling. In-mold polycarbonate shell with EPS foam for impact absorption and lightweight. Includes a detachable visor that shades your face from the sun. 16 optimized vents combine aerodynamic performance and cooling airflow. Adjustable dial system for perfect fit, suitable for head circumference: 56 – 62cm (22.0"-24.4"). Breathable, removable soft chin guard for a comfortable fit. Reflective sticker improves visibility, safe for riding at night. Removable moisture-wicking lining for added comfort.